A View from the Bridge is a play by American playwright Arthur Miller. It was first staged on September 29, 1955, as a one-act verse drama with A Memory of Two Mondays at the Coronet Theatre on Broadway. The run was unsuccessful, and Miller subsequently revised the play to contain two acts; this version is the one with which audiences are most familiar. The two-act version premiered in the New Watergate theatre club in London's West End under the direction of Peter Brook on October 11, 1956. The play is set in 1950s America, in an Italian-American neighborhood near the Brooklyn Bridge in New York. It employs a chorus and narrator in the character of Alfieri. Eddie, the tragic protagonist, has an improper love of, and almost obsession with, Catherine, his wife Beatrice's orphaned niece, so he does not approve of her courtship of Beatrice's cousin Rodolpho. Miller's interest in writing about the world of the New York docks originated with an unproduced screenplay that he developed with Elia Kazan in the early 1950s (titled The Hook) that addressed corruption on the Brooklyn docks. Kazan later directed On the Waterfront, which dealt with the same subject. 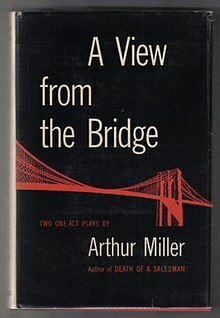 Miller said that he heard the basic account that developed into the plot of A View from the Bridge from a lawyer who worked with longshoremen, who related it to him as a true story. Eddie convinces himself that Rodolpho is homosexual and is only expressing interest in Catherine so he can marry her and gain status as a legal citizen. He confronts Catherine with his beliefs and she turns to Beatrice for advice. Beatrice, starting to realize Eddie's true feelings, tells her that she should marry Rodolpho and move out. In the meantime, Eddie turns to Alfieri, hoping for help from the law. However, Alfieri tells him that the only recourse he has is to report Rodolpho and Marco as undocumented. Seeing no solution to his problem, Eddie becomes increasingly desperate and takes his anger out on Rodolpho and, in teaching him to box, 'accidentally' injures him. Marco reacts by quietly threatening Eddie, showing his strength by holding a heavy chair above Eddie's head with one hand and 'smiling with triumph'. Eddie visits Alfieri and insists that the kiss has proved Rodolpho is gay and that he is only marrying Catherine for citizenship, but once again Alfieri says the law cannot help. Out of desperation, Eddie phones immigration services but in the meantime Beatrice has arranged for Marco and Rodolpho to move in with two other undocumented immigrants in the flat above. Eddie learns that Catherine and Rodolpho have arranged to marry within a week and about the two new immigrants that have moved into the building and, with both anger and fright, frantically urges Catherine and Beatrice to move them out. When immigration officials arrive and arrest Marco, Rodolpho, and the two other immigrants, Eddie pretends that the arrest comes as a complete surprise to him, but Beatrice and Marco see through this. Marco spits in Eddie's face in front of everyone and accuses Eddie of killing his starving children. Eddie tries to convince the neighborhood of his innocence but they turn away from him. The one-act, verse version of A View from the Bridge opened on Broadway on September 29, 1955, at the Coronet Theatre (now the Eugene O'Neill Theatre); Marilyn Monroe was in the audience. It ran for 149 performances. This production was directed by Martin Ritt and the cast included Van Heflin as Eddie and Eileen Heckart as Beatrice. Its two-act version premiered in London's West End under the direction of Peter Brook. It opened at the New Watergate theatre club (currently Harold Pinter Theatre) on October 11, 1956, and the cast included Richard Harris as Louis and Anthony Quayle as Eddie, with lighting design by Lee Watson. Dustin Hoffman acted as assistant director and stage manager for a successful 1965 production of the play Off-Broadway at the Sheridan Square Playhouse in New York City. The play's director, Ulu Grosbard, suggested to Arthur Miller that Hoffman would one day make a great Willy Loman (a role that Hoffman would later play to great acclaim). Miller was unimpressed and later wrote that "My estimate of Grosbard all but collapsed as, observing Dustin Hoffman's awkwardness and his big nose that never seemed to get unstuffy, I wondered how the poor fellow imagined himself a candidate for any kind of acting career." Another production in New York opened on February 3, 1983, at the Ambassador Theatre, with Tony Lo Bianco as Eddie and directed by Arvin Brown. It ran for 149 performances. An award-winning production in New York opened on December 14, 1997, at the Criterion Center Stage Right and subsequently transferred to the Neil Simon Theatre. It ran for 239 performances. It was directed by Michael Mayer and the cast included Anthony LaPaglia, Allison Janney, and a young Brittany Murphy. The production won the Tony Award for: Best Revival of a Play; Best Leading Actor in a Play (LaPaglia); it also won Drama Desk Awards for Outstanding Revival, Outstanding Featured Actress in a Play (Janney), and Outstanding Direction of a Play. A revival at the Cort Theatre on Broadway in 2009 starred Liev Schreiber, Scarlett Johansson and Jessica Hecht. The limited, 14-week engagement, directed by Gregory Mosher, began with previews on December 28, 2009, and officially opened on January 24, 2010. It ran until April 4, 2010. Johansson won a Tony Award for her performance. From October 2015 through February 2016, a production of the play that originated at the Young Vic Theatre in London in 2014 ran on Broadway at the Lyceum Theatre featuring its original London cast. It won the Tony Award for Best Revival of a Play; the director, Ivo van Hove won the Tony Award for Best Direction of a Play. The National Theatre of Great Britain staged a production in 1987 at the Cottesloe Theatre. It was directed by Alan Ayckbourn and Michael Gambon gave an acclaimed performance as Eddie. Time Out called the production "near perfect" and the New Statesman called it "one of the finest events to be presented at the National Theatre since it moved to the South Bank." Another West End production was staged at the Duke of York's Theatre, opening in previews on January 24, 2009, and officially on February 5. It ran until May 16, 2009. It was directed by Lindsay Posner, with Ken Stott as Eddie, Mary Elizabeth Mastrantonio as Beatrice, Hayley Atwell as Catherine and Harry Lloyd as Rodolpho. The production subsequently toured the UK. In 2014, Belgian director Ivo van Hove and lead actors Mark Strong (as Eddie), Phoebe Fox (Catherine), and Nicola Walker (Beatrice) revived the play to huge success at the Young Vic. This revival won three Laurence Olivier Awards in April 2015, for Best Actor (Mark Strong), Best Revival and Best Director (Ivo van Hove). The Young Vic production transferred to Broadway with its British cast intact. In 1992, the Royal Exchange, Manchester staged a production directed by Greg Hersov with Jonathan Hackett, Michael Sheen and Kate Byers. After Ivo van Hove's production closed on Broadway, it was restaged by the Centre Theatre Group of Los Angeles with a new cast that included Frederick Weller (Eddie), Andrus Nichols (Beatrice), Catherine Combs (Catherine), Alex Esola (Marco), and David Register (Rodolpho); this cast then toured to the Kennedy Center in Washington. In 2017, van Hove directed the play at the Goodman Theatre in Chicago. Combs and Nichols reprised their roles, joined by Ian Bedford as Eddie. In 2005, a new film version of A View from the Bridge was announced to be directed by Barry Levinson, with Anthony LaPaglia as Eddie, Scarlett Johansson as Catherine, and Frances McDormand as Beatrice, but it never went into production. In January 2011, Variety reported that another version of the film was scheduled to begin shooting in June in Melbourne and New York with new director Robert Connolly and a cast featuring LaPaglia, Vera Farmiga, Mia Wasikowska and Sam Neill, but it never went into production after Miller's daughter Rebecca rejected LaPaglia's request to extend the rights to the film that had expired on October 11, thus officially ending the project. On 4 April 1966, ITV aired A View from the Bridge as its "ITV Play of the Week", of which no copies survive. Vallone also played Eddie in that version. L.A. Theatre Works released a radio adaptation of the play in 1998. BBC Radio 3 produced a radio adaptation in 2017. ^ Christopher Bigsby, The Cambridge Companion to Arthur Miller, pp. 104–108, Cambridge University Press, 2010 ISBN 0-521-74538-1. ^ Arthur Miller, A View from the Bridge / All My Sones (London: Penguin, 1961), p.9; Arthur Miller, Introduction to Plays: One (London: Methuen, 1988), p. 51. ^ "Dustin Hoffman Biography". Tiscali. 2008. Archived from the original on 2008-12-11. Retrieved 2008-10-22. ^ a b Ben Brantley (January 25, 2010). "A View From Brooklyn of Tragedy Most Classic". The New York Times. Retrieved 2010-01-25. ^ "Alan Ayckbourn's Official Website | A View from The Bridge – Reviews". Archived from the original on 22 March 2016. Retrieved 16 December 2016. ^ Barnett, Laura, "A View from the Bridge review – 'visceral and vital'" Archived 2016-11-23 at the Wayback Machine The Guardian, 12 April 2014. Retrieved 2014-04-23. ^ Desk, BWW News. "L.A. Cast Set for Ivo van Hove's A VIEW FROM THE BRIDGE at Kennedy Center". BroadwayWorld.com. Retrieved 2019-02-28. ^ Po, Michael; l (2016-11-22). "Review #1: 'A View From the Bridge' at The Kennedy Center". DC Metro Theater Arts. Retrieved 2019-02-28. ^ "A View from the Bridge | Goodman Theatre". www.goodmantheatre.org. Retrieved 2019-02-28. ^ Jones, Chris. "Fall Theater: Ivo van Hove on 'View From the Bridge' and being wrong about Arthur Miller". chicagotribune.com. Retrieved 2019-02-28. ^ Rohdie, Sam (1992). Rocco and His Brothers – Rocco e i suoi fratelli. British Film Institute Publications. ^ Russo, Vito (1986). The Celluloid Closet: Homosexuality In The Movies. Harper & Row. p. 138. ISBN 978-0060961329. ^ Michael Fleming (15 February 2005). "The Bigscreen 'View': Cast, Helmer Set for Miller Play Adaptation". variety. Retrieved 2008-10-22. ^ Lodderhose, Diana (18 January 2010). "Farmiga, Wasikowska join Bridge". Variety. Archived from the original on 23 January 2011. Retrieved 18 January 2010. ^ Don Groves (13 October 2011). "Window shuts on A View from the Bridge". SBS Film. Archived from the original on 20 December 2016. Retrieved 1 January 2012. ^ Desk, BWW News. "A VIEW FROM THE BRIDGE Plays Vertical Player Repertory Theatre 10/22-11/1". broadwayworld.com. Archived from the original on 16 April 2018. Retrieved 9 May 2018. Wikimedia Commons has media related to A View from the Bridge.